You found me! Thank you! Before I tell you my story, let me guess yours. 1. You LOVE to eat. As in, you like to think about food, share food, explore food, make food, shop for food, write about food, read about food, travel for food,………..you get the idea. 2. You are a curious and insatiable learner. You eat life. If you are not traveling and learning new things, you are dreaming of it and always plotting your next adventure. 3. You are open minded and generous. Why else would you be willing to let someone else prattle along and take up your time? I am much like you. I live to eat, learn and share. Blogging is a strange form of pen paling (for those of you who remember doing so in school), isn’t it? Instead of sending off letters to far off places and waiting for a reply, here we are sharing our lives with imagined but very real readers. So again, welcome and thank you for sharing your time with me. I live in a small town in Indiana, USA. Very flat. Lots of corn. Mostly for fuel not food (we can debate that later). Not much excitement. So I eat. A lot. I was born in Bangladesh which means I’m VERY familiar with spice. I’ve lived in Michigan, Connecticut, Texas, New Jersey, Virginia, New York and Louisiana. So, I enjoy everything from clam chowder, grinders, chicken fried steak to seafood gumbo. I’m married to Jim, a wonderful Georgia gentleman. So now, I have added a lot of southern tastes to my table. My recipe for Tandoori Fried Chicken is a good representation of our relationship. We share four daughters with distinct flavor palates. Cooking for this, chopped and blended family is both a challenge and a joy. As you can see, like most of us, food is how I relate to people and places. For me cooking is the ultimate and most intimate form of communication (think the novel/movie…Like Water for Chocolate). Inauthentic recipes inspired by and inflicted on my nutty chopped and blended family. Hoping it’ll become a live cookbook for my daughters. Literary references and food writing that I find inspiring. Yes….I’m a nerd and love books as much as food. Design references related to food. I studied architecture and philosophy (aesthetics). Visual thinking is a hard habit to break. My misadventures as the wobblyogi. Yoga helps me focus…on my breathing, my movements….my food…I do have a one-track mind. I eat, cook, read and write. And move in-between. 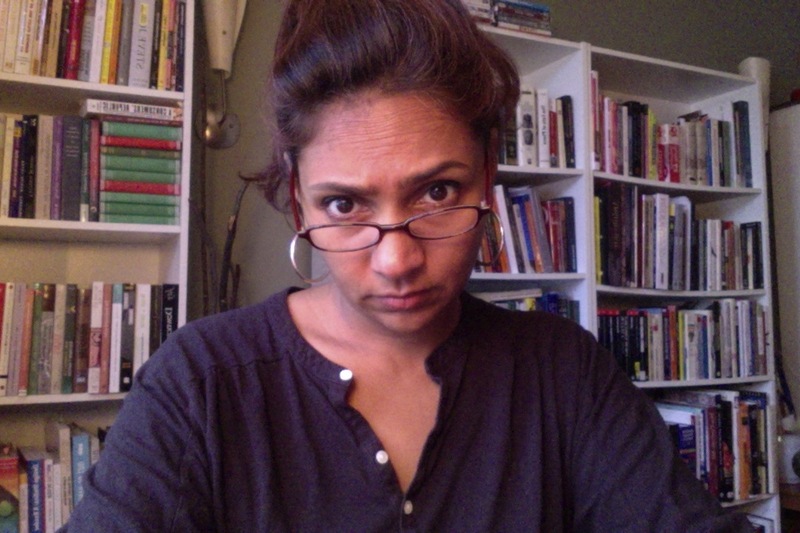 Here is what I look like as I’m writing a post. Note the confusion and general nerdiness. Please don’t hold it against me. I look forward to meeting each of you and learning about your food stories. Let’s eat, learn and share. Wonderful! Glad to meet you Chez, my fellow egg enjoyer. Thank you for stopping by and your kind words. Its all about making ourselves at home in this crazy weird world, isn’t it??? Enjoying your beautiful blog too and very much looking forward to swapping more food, travel and home stories.